“You need to tell me where the gun is. 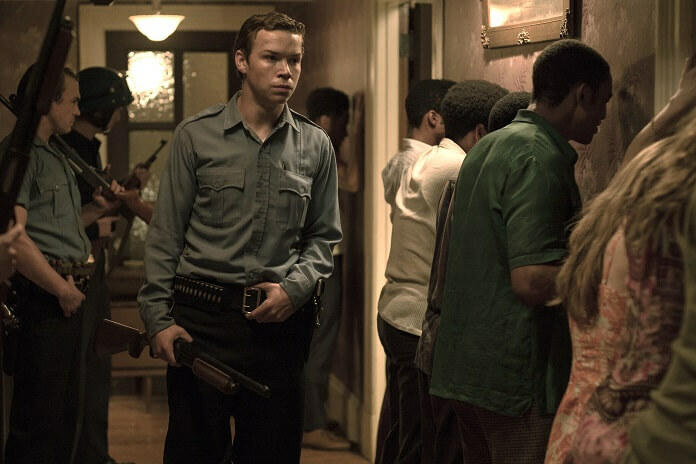 I’ve got all night, people,” says officer Krauss (Will Poulter) to several young people being held for questioning during the race riots that took place in Detroit in the summer of 1967 in the dramatic film, Detroit. The film begins with a short prologue explaining how racial tensions in Detroit were at a boiling point in the summer of 1967. After the raid of an illegal, after-hours, all black nightclub, the African-American community has had enough of what they know is persecution from the police and rioting erupts. Kathryn Bigelow’s film examines the atmosphere of of Detroit in ’67 before delving into the Algiers Motel incident which left three teenagers dead and nearly a dozen other people injured. Dismukes (John Boyega) is just trying to make it through the night at his job as a security guard when he makes his presence known to the nearby National Guard troops by offering them some coffee as they stand watch on the look-out for snipers. Larry (Algee Smith), an up-and-coming singer trying to make his way in the R&B world, and his best friend, Fred (Jacob Latimore), decide to lay low at the Algiers Motel until the riot eases up enough for them to get home. They quickly make friends with two young white girls and are introduced to some of their black friends. Among them is Carl (Jason Mitchell) who fires off a starter pistol in the room to scare Larry and mockingly out the window at the police. The police, the National Guard, and Dismukes fear it’s another sniper and quickly surround the motel. Led by racist Officer Krauss, the men enter the building, shooting and terrorizing the guests in the motel. Once inside and in control, Officer Krauss and his men line up Larry, Fred, the two young girls (who they greatly disapprove of socializing with black men), and the others and begin questioning them about the location of the gun. They demand to know who fired the weapon, beating and taunting the group for the answer without reading them their Miranda rights. As the night goes on, Krauss and his local cops abuse their authority. As a result of the continued beatings, thee black men die. Directed by Kathryn Bigelow (The Hurt Locker, Zero Dark Thirty) and based on historical events, Detroit is a tense, compelling, and disturbing film that captures the racial divide and tensions in the late 1960s and the brutality and bloodshed that occurred because of it. It brings back to life a part of America’s ugly past via strong direction and a solid cast. John Boyega is perfectly cast as the security guard who winds up at the motel trying to help find the sniper and ends up struggling to help the trapped guests at the Algiers Motel, who are under suspicion from the hateful and racist local cops, survive the night. He’s one of the few sane and decent individuals trying to keep a very bad situation from becoming even more horrible. Will Poulter gives a chilling performance as Krauss, the racist lead officer who seems to have no conscience and enjoys abusing his authority, terrifying and beating the motel guests as he conducts his interrogation. He has no problem in killing if he deems it necessary. It’s a truly powerful and disturbing portrayal, and one that should be remembered come Oscar season for Best Supporting Actor. The biggest problem, and the film’s weakness, is its ambition, being too broad at first and focusing for too long on the events that caused the massive riot in Detroit back in 1967 before narrowing in scope to focus on the terrible events that occurred at the Algiers Motel. Detroit spends too much time leading up to the brutal and tragic events at the motel while introducing the characters who will have their lives changed forever in the events that follow. The movie then races through the courtroom drama of the trial of the three cops and security guard for their actions. However, minor flaws aside, Detroit powerfully and effectively recaptures a dark, unsettling, and hateful part of America’s past.